Takedowns are core to Onrush. Risk equals Reward so take on the track and seek out the multitude of perilous but exciting routes through each track. Speed off cliff edges and traverse huge ramps flying hundreds of feet through the bold, bright sky. Land with immense force crushing any opposing teams vehicles unfortunate enough to be below. There’s no holding back as you attempt to take on more & more treacherous routes to find the perfect vantage point. Explore and use the environments to barrel roll hundreds of feet through the air, vault off cliff edges, boost off ramps and even dive round the side of a 400ft Dam. Racing at breakneck speed only gets you so far. To really gain an unworldly edge, build your bar and unleash the invulnerable, euphoric blast of speed and power RUSH!! Completely unique to each vehicle in both look and ability, this is like nothing seen in any racing game before. Be part of the team and attack as a pack working together to earn Points, XP, Medals, Boost and ultimately ‘RUSH’ to obliterate the opposing team. With no start or finish line Onrush is a constant exhilarating stampede of action. Been wrecked? Then hold your breath! as you respawn instantly back in the action and ready for revenge. The soundtrack to Onrush as alive as the game itself. The game pulls songs from a huge library of explosive edge of your seat tunes that mix and adapt as you drive. The type, speed and volume of the tracks all change in real-time reflecting the action in the game. *PlayStation Plus required for online multiplayer. 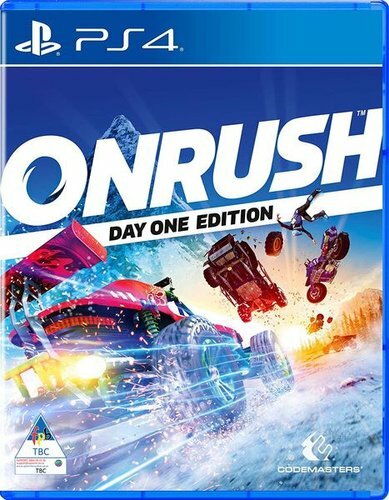 TAKEDOWNS - Takedowns are core to Onrush. Risk equals Reward so take on the track and seek out the multitude of perilous but exciting routes through each track. Speed off cliff edges and traverse huge ramps flying hundreds of feet through the bold, bright sky. Land with immense force crushing any opposing teams vehicles unfortunate enough to be below. VERTICALITY - There’s no holding back as you attempt to take on more & more treacherous routes to find the perfect vantage point. Explore and use the environments to barrel roll hundreds of feet through the air, vault off cliff edges, boost off ramps and even dive round the side of a 400ft Dam. RUSH - Racing at breakneck speed only gets you so far. To really gain an unworldly edge, build your bar and unleash the invulnerable, euphoric blast of speed and power RUSH!! Completely unique to each vehicle in both look and ability, this is like nothing seen in any racing game before. TEAM PLAY - Be part of the team and attack as a pack working together to earn Points, XP, Medals, Boost and ultimately ‘RUSH’ to obliterate the opposing team. ALWAYS IN THE ACTION - With no start or finish line Onrush is a constant exhilarating stampede of action. Been wrecked? Then hold your breath! as you respawn instantly back in the action and ready for revenge. ADAPTIVE SOUNDTRACK - The soundtrack to Onrush as alive as the game itself. The game pulls songs from a huge library of explosive edge of your seat tunes that mix and adapt as you drive. The type, speed and volume of the tracks all change in real-time reflecting the action in the game. Outstanding game, great fun at a good price! I highly recommend it!! !